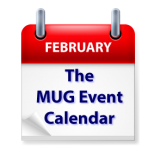 A busy week on The MUG Event Calendar is highlighted by a visit to one Texas group by The Mac Observer’s Jeff Gamet, and another Texas group by Bob “Dr. Mac” LeVitus. Chris Heinonen of The Wirecutter will be discussing cord cutting, 1Password for families will be the featured topic in Oregon, and HomePod will be examined in Michigan. Other topics for the week include cybersecurity, audio and video editing on the Mac, more cord cutting, iPhone and more.